Everyone loves a good vacation. After months of stressing out and being cramped with work, a day on an exotic beach or dining on a cruise ship sounds good right about now. 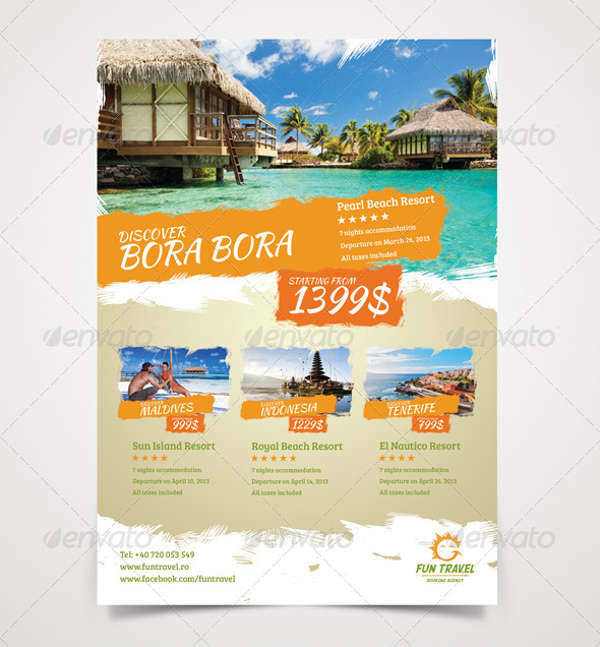 If you happen to be on the other side of the coin and are in the business of making people’s dream vacations come true, then what you need is a good travel flyer. Travel flyers make desirable places even more so. They should be able to draw people in, making them want to visit and explore what else the place has to offer. 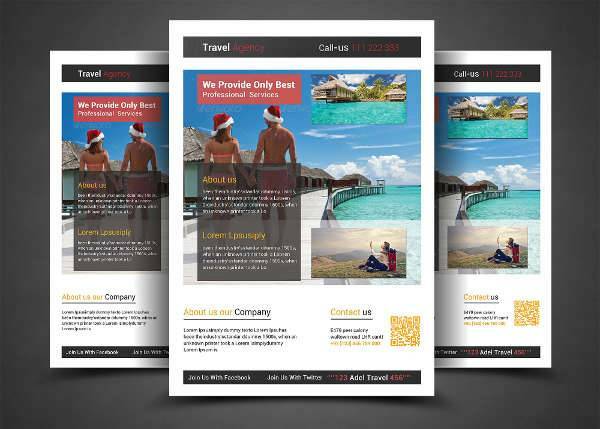 If you’re still working on your flyers, take a look at our travel flyer designs to get some ideas. They’re downloadable and easy to edit. 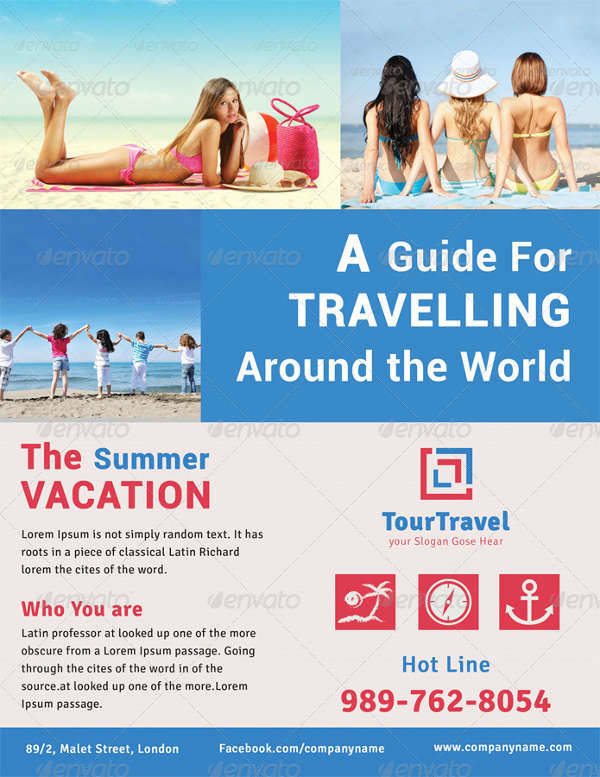 There are certain types of travel flyers one can make for different kinds of travel. 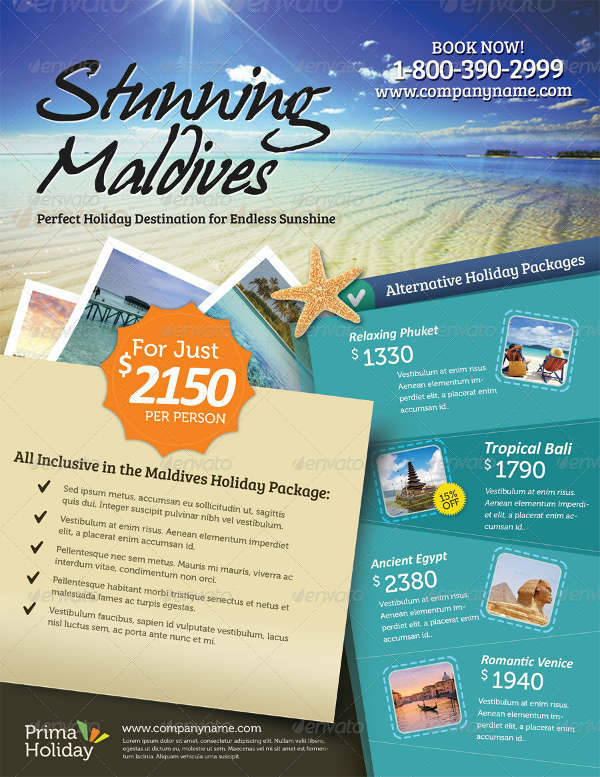 Depending on the purpose of your travel flyer, you can emphasize features other than the destination itself. This can greatly impact the effectiveness of your work, so you have to make sure you’ve got everything organized in terms of your goals. 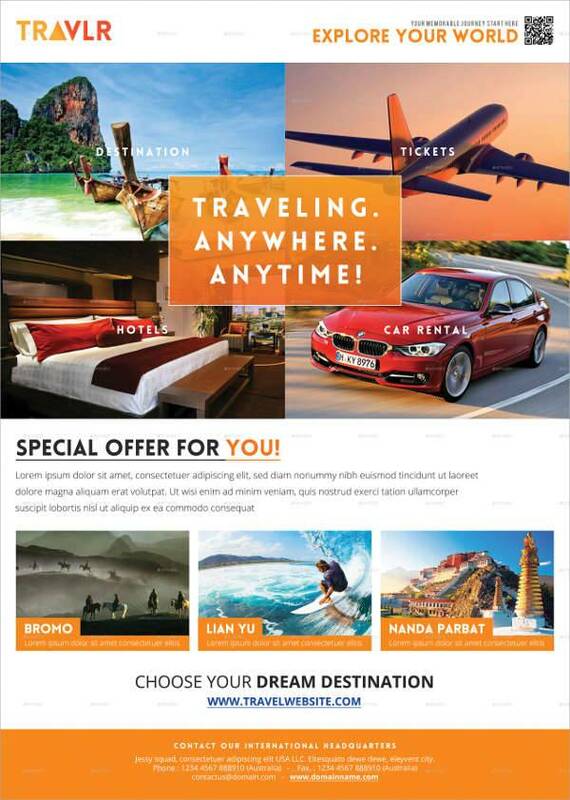 A travel flyer can be presented in a lot of ways. Information can be delivered in a more formal manner or even creatively. You can make use of different adjectives and catchy taglines, and they have to be reader-friendly. The overall mood of the flyer should be open and inviting. 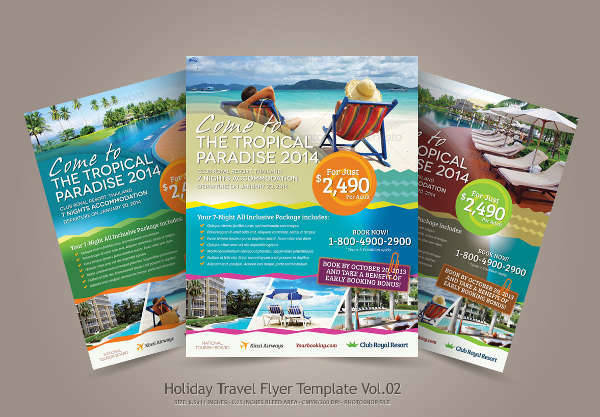 Get a good grasp on the different types of travel flyers to make yours the best they can be. Generally, travel agencies help make traveling easier and more convenient for you. They cover certain expenses or speed up document processing for good deals. 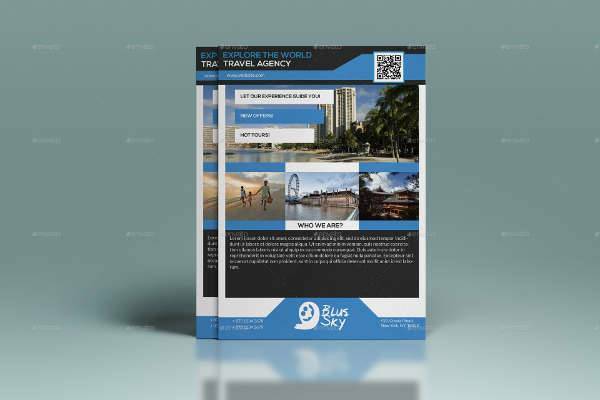 Agencies often make promotional flyers and travel agency brochures that may serve several purposes. 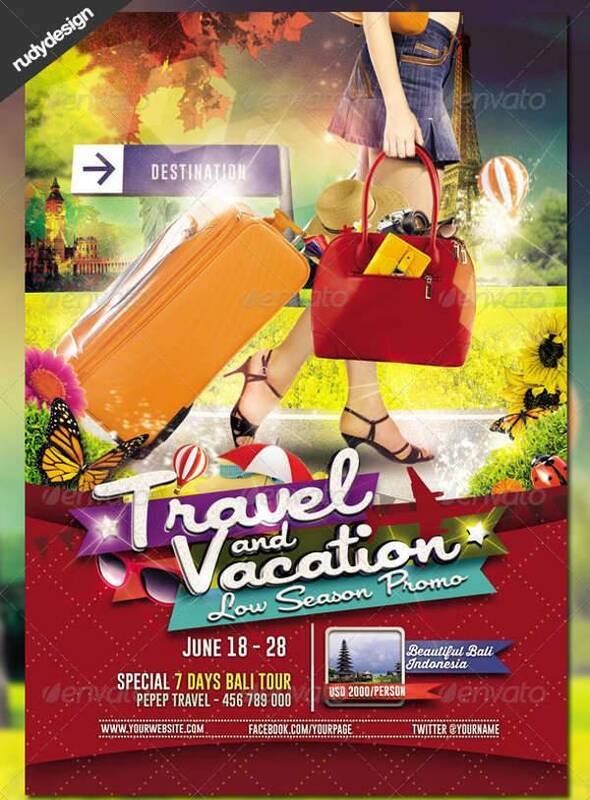 Some travel flyers made by agencies promote tourism and holiday tours. These are mainly for leisure; a couple of days to relax and do recreational activities. These kinds of flyers are more lively and creative. 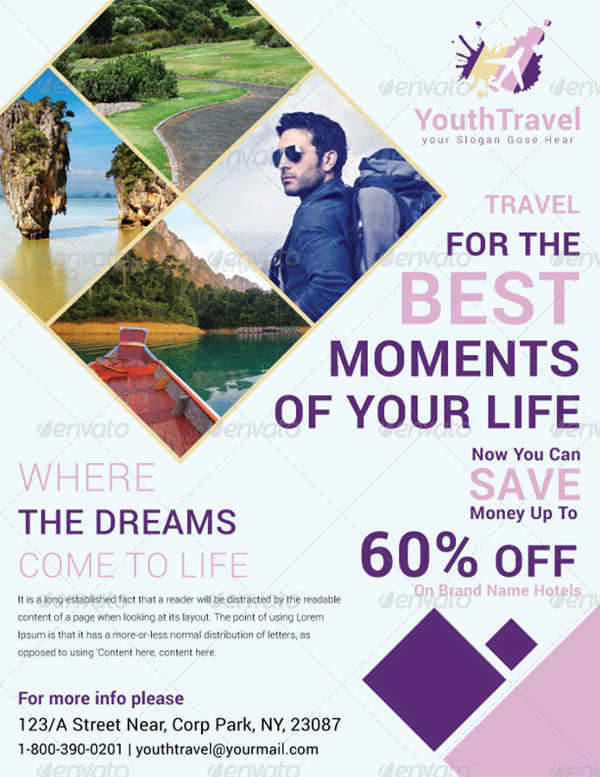 There are also travel flyers that are more inclined to business travels and migration. These types of flyers can be more straightforward and professional. They all feature travel packages for you to choose from. The layouts of these flyers often differ, depending on their purpose. A cruise ship is a type of luxury travel where the amenities and activities in the ship are just as much part of the travel experience aside from the many stops made along the way. 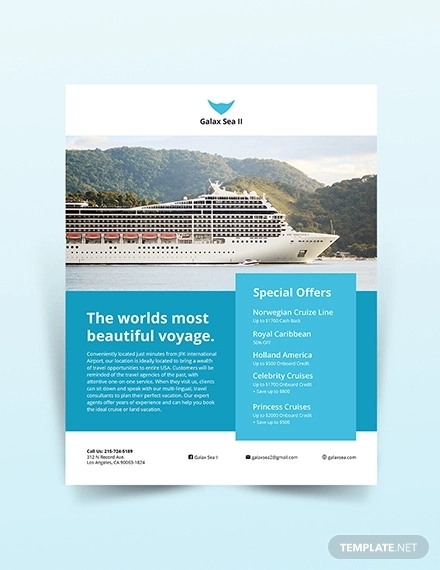 Cruise ships also have travel flyers to promote their exciting voyage. They can be professional flyers or creative ones. 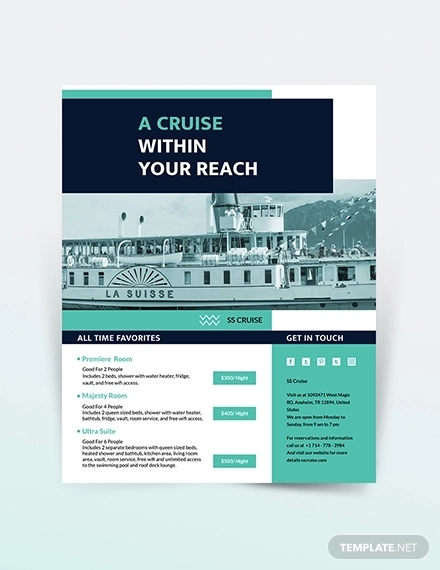 The most effective type of cruise ship flyer is usually a combination of both. There are certain music festival and concerts held in exotic places or remarkable destinations. 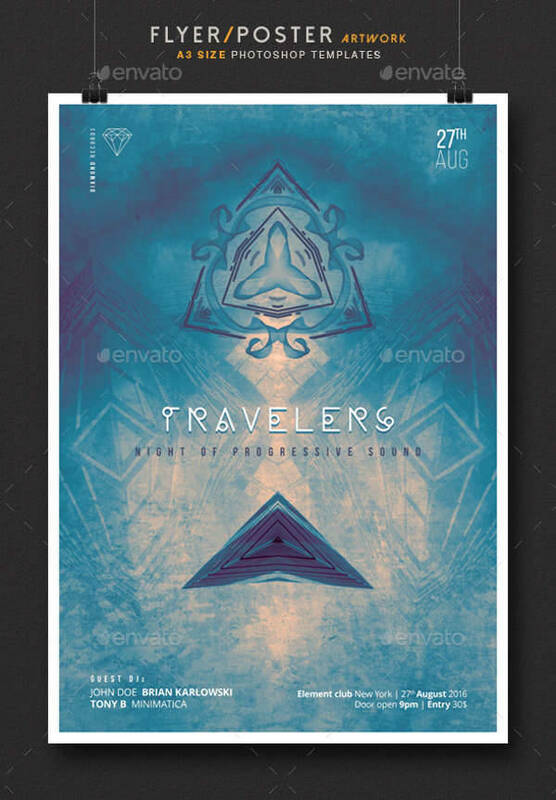 These call for artistic flyer designs featuring their location. 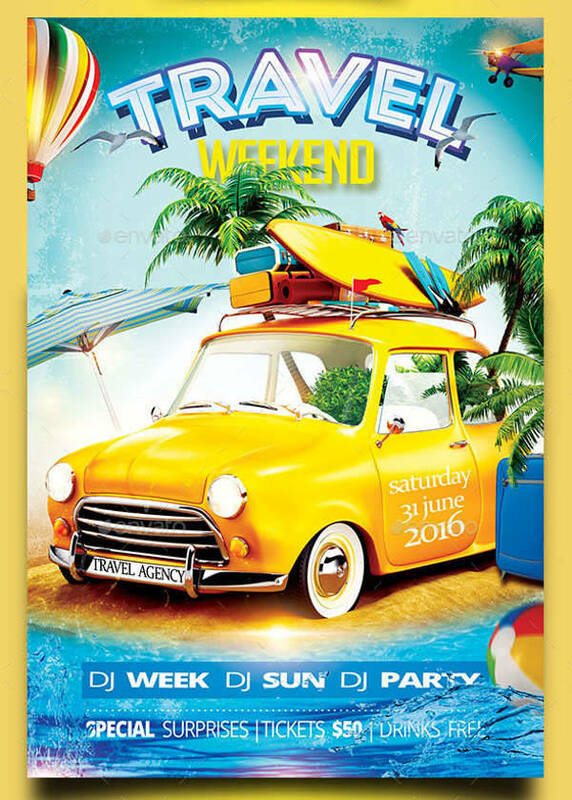 However, travel flyers for these kinds of events put more emphasis on the event itself. They are more focused on featuring the artists, performers, or activities than the location itself. 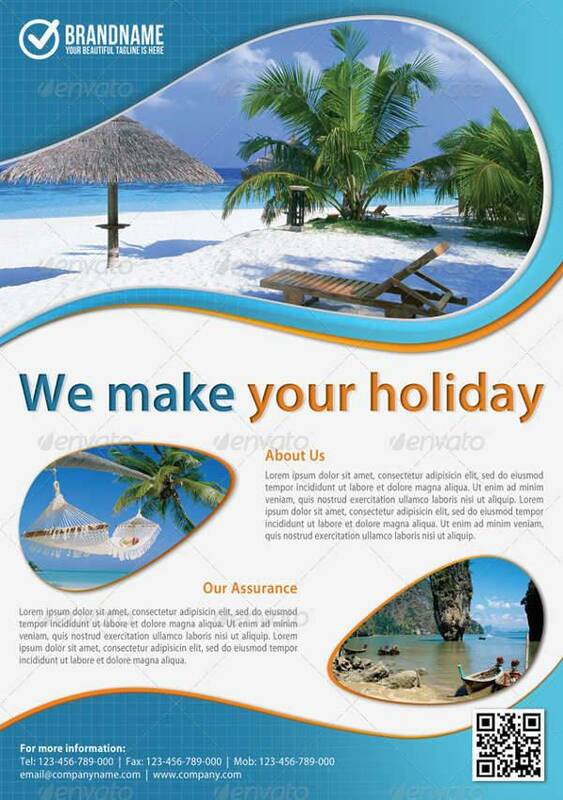 One kind of design you can use for your flyer is the professional travel flyer. Professional travel flyers are direct and informative. 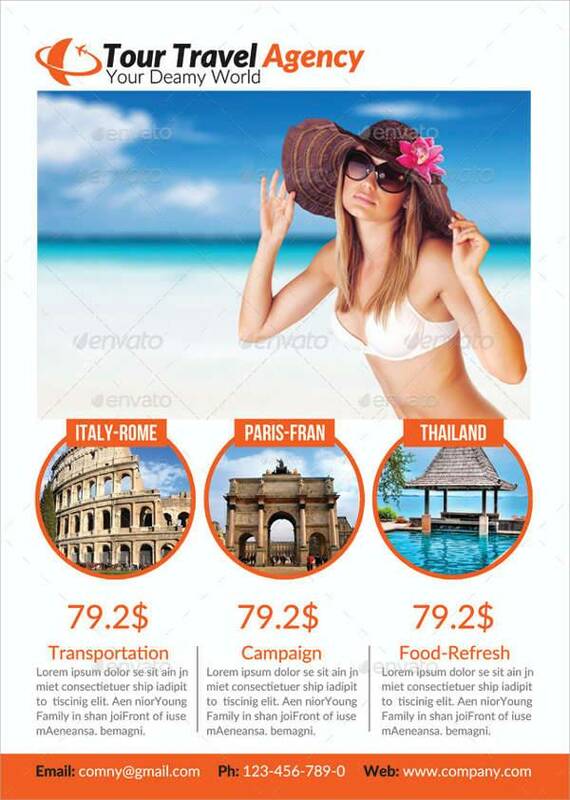 Professional travel flyers use simple layouts with an organized structure for photos and text. Aside from colored images, the background and font usually consist of one or two colors only. 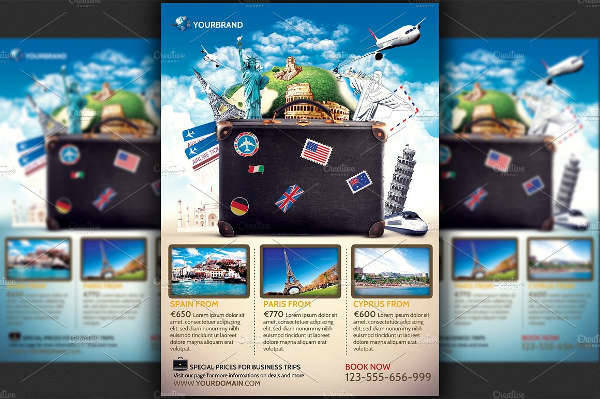 A professional travel flyer is suited for businessmen and professionals going on a business trip. All the information one would need to travel should be present in the flyer and is the top priority. 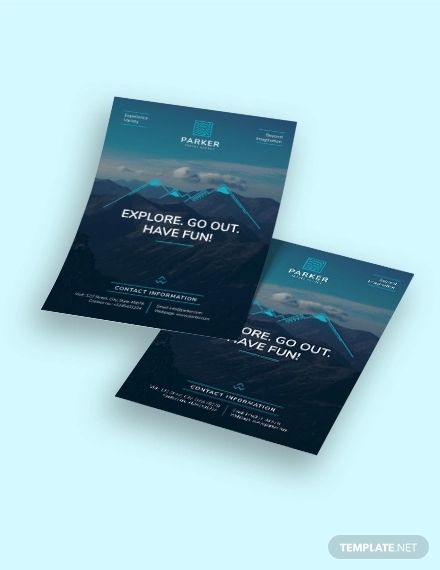 Travel flyers can be simple and elegant. They are informative with a bit of creativity. 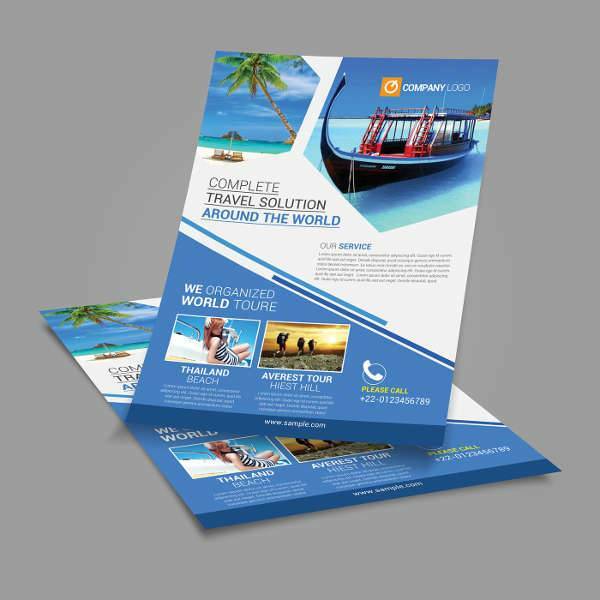 Unlike professional travel flyers, elegant travel flyer designs have more creative freedom but in a subdued manner. 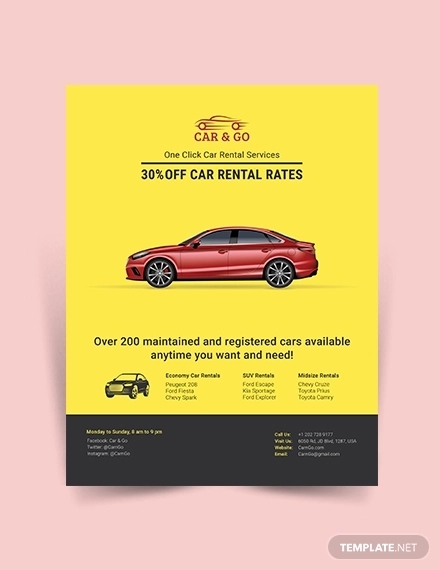 A simple and elegant flyer must have balance in terms of color, font, and image choice. You can work freely on your layout to make them dynamic while making sure all the information is still clear and understandable. 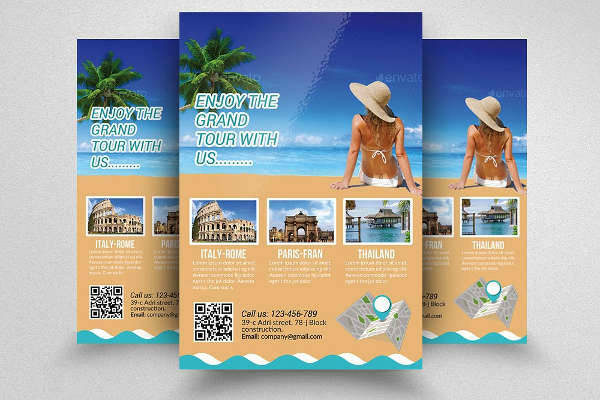 Setting a theme for your travel flyers can be a risky move, but it can be pretty rewarding if you pull it off. 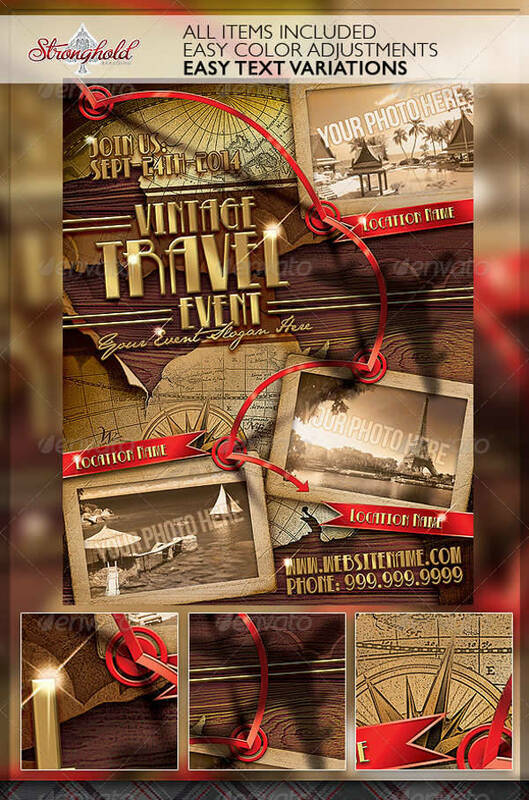 A vintage theme for a travel flyer is very uncommon and can set your flyers apart from the others. There are several ways to make vintage travel flyers work. They are especially effective when featuring historical places. You can use old photos of tourist spots in black and white, with colored photos of their current state. You can also make use of appropriate vintage fonts. 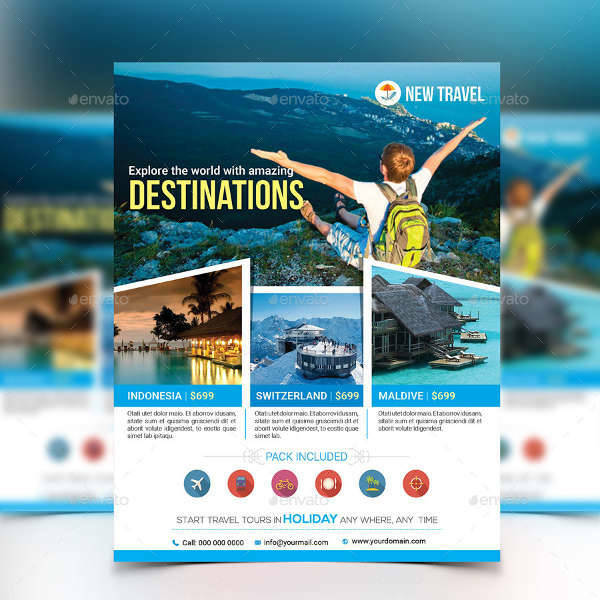 Flyers for hot travel destinations intended for leisure, relaxation, and recreation should be fun and exciting to look at. They promote not just the place but also the idea of you having the best time of your life. As much as possible, this feeling should exude from the use of photos, colors, and wording. Fun travel flyers show all the best features of a certain location. From spa treatments to cuisine, the travel flyers must be engaging and enticing. Their designs are colorful and bright, with lively fonts and background images. Minimalist flyer designs are not only limited to the background images, colors, and typefaces used in a flyer. They can also mean the amount of information being given. Minimalism adds character. 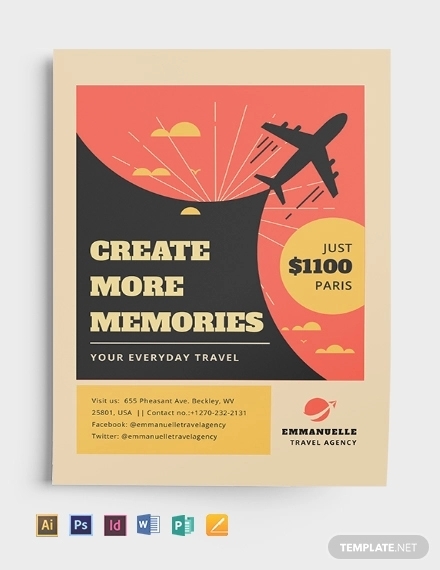 Travel flyers can look good in minimalist designs, but that would also depend on whatever they are promoting. If it’s a concert or club event in a foreign, tropical island, the air of mystery is very much welcome. You can feature the location with a single photo and text, and the names of the DJ’s. 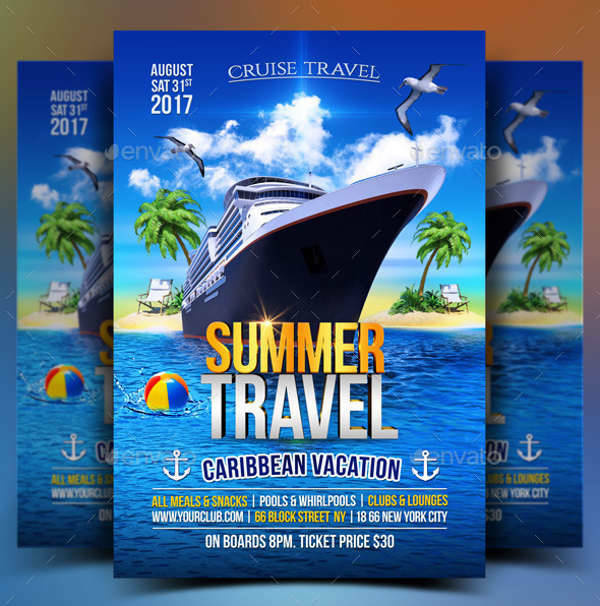 If your travel flyer is out to promote family vacations in tropical beaches and historical lands, our holiday and summer tour flyer designs have you covered. When promoting a family vacation tour, present images that evoke a homey feeling. You can also show landmarks that are perfect for family photos. The packages you offer should include activities that can be done as a group. Your colorful family vacation flyers should also be informative. Remember that the target audience is the parents who will read them and eventually finance the trip. Present all your information clearly, but with a light tone. 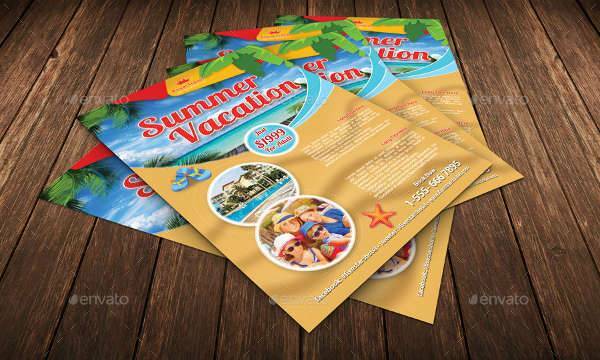 These flyers can also be aided with a vacation brochure to maximize advertising. Featured Destination – Some flyers feature one specific destination, while others feature a series of countries or locations as a package deal. 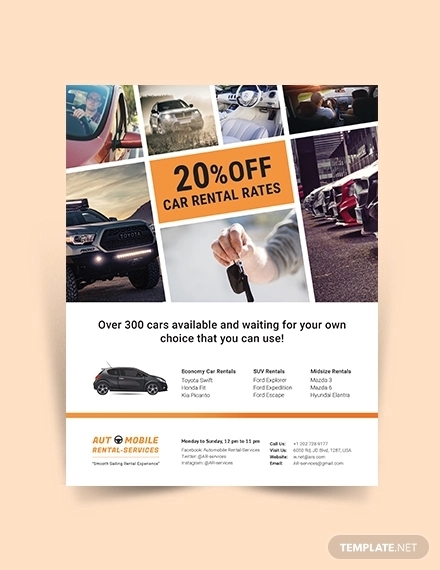 Show them off on your flyers with images and text. Travel Packages – Your travel packages should be complete and detailed. It’s very important for potential customers to be informed as it will affect your business or agency. You don’t necessarily have to include every last bit of information about an offer per se, but you do need to present a clear overview with their corresponding prices. 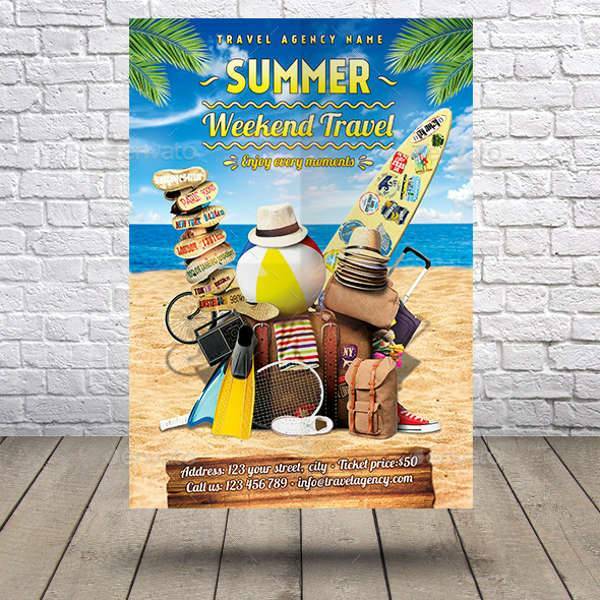 Activities – If you’re featuring a specific travel destination, you may include all the activities one can take part in once he or she is there. Famous landmarks and unique cuisine are usually common features on a travel flyer. 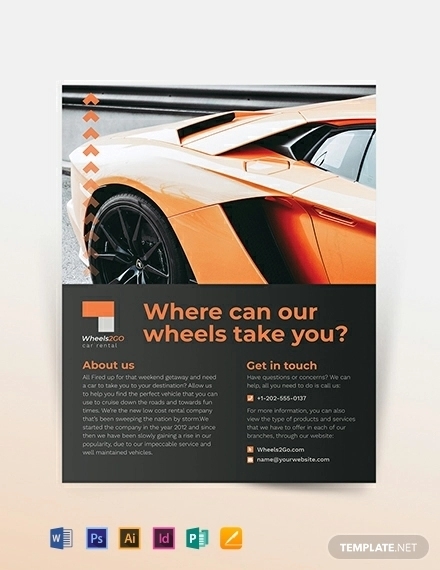 Contact Details – Potential customers are bound to have a lot of questions and inquiries about your flyer. Don’t leave your them hanging by not giving them the means to contact you. You can place you contact details at the bottom of the flyer in a different font or color to ensure visibility. 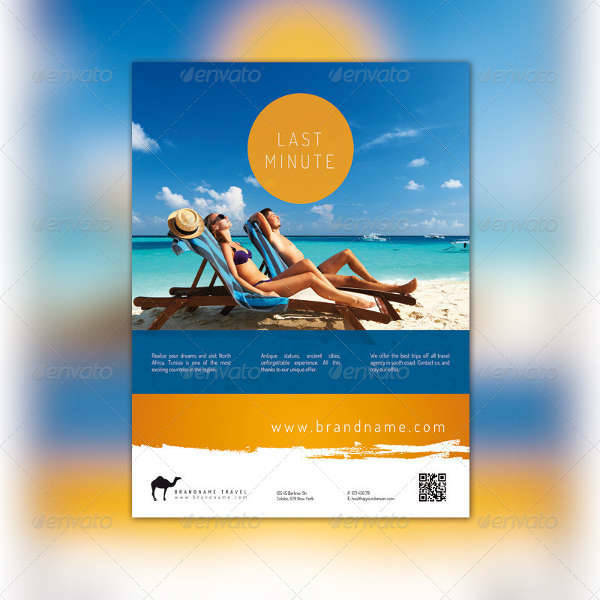 Duration – If your flyer contains special offers and discounted packages, indicate the deadline or expiration so people can better prepare for it; or so the don’t keep their hopes up when they missed the opportunity. For music festival and destination concerts, some of the rules may bend a little. Nonetheless, they still have essential details that shouldn’t be left out from their travel flyers. 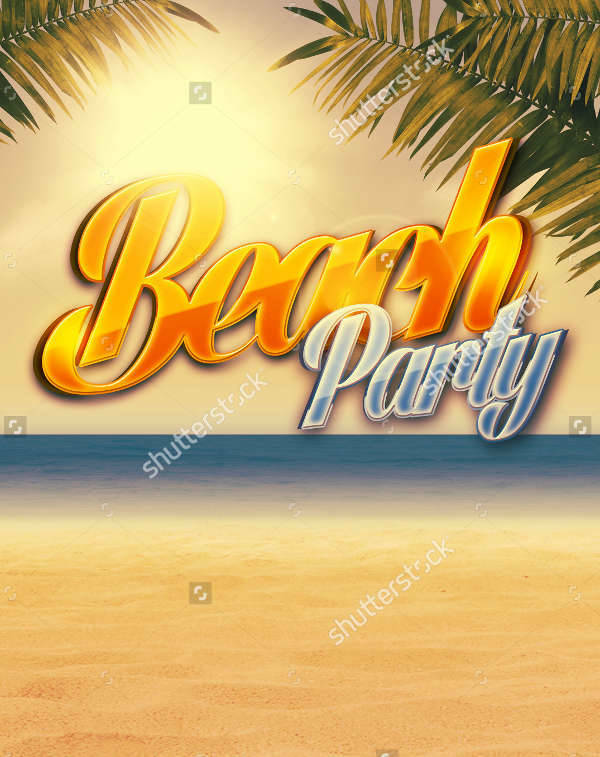 You may also check out templates for party flyers as they tend to look similar. Featured Artists – The main acts are given priority and emphasis more than the destination. Make your headliners clear and visible to spark the people’s interest. 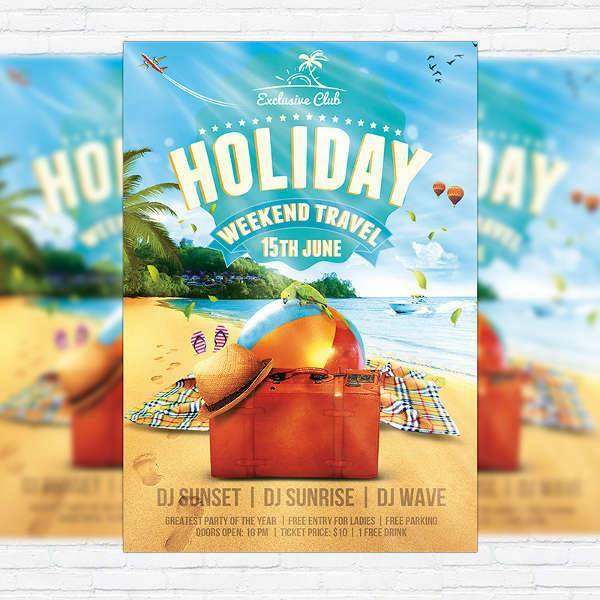 Location – An image of the venue can serve as the background of your travel flyer. You can incorporate a faded quality to them or edit the hues and colors of your background to match the theme of the event. Date and Time – Music festivals and concerts don’t exactly happen anytime at any day. Include the specifics of your event so the audience can save the date and arrive on time. Ticket Prices – Your ticket prices can be featured in smaller text compared to the rest of the information given. 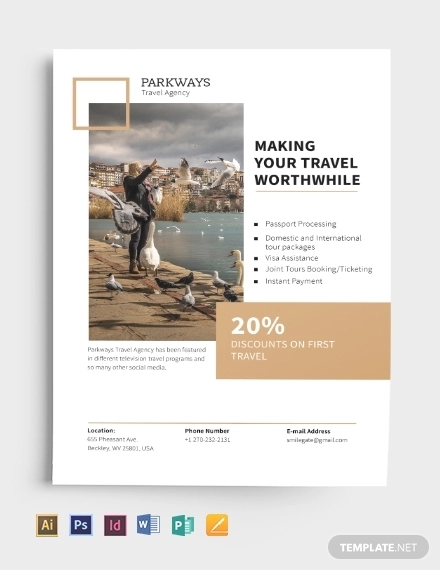 With all that in mind, you can now get started on your own unique travel flyers. 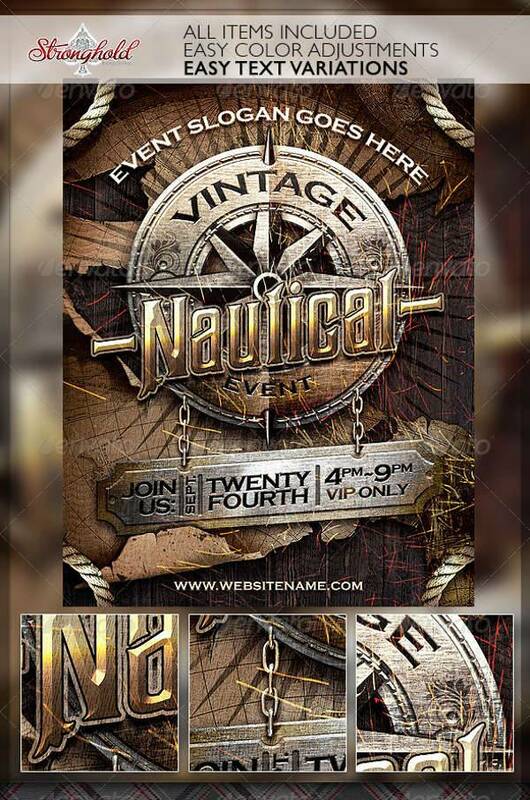 If you’ve got a clear vision of what you want for your flyers, it gets pretty easy putting the elements together. Always remember to balance the informative and creative aspects of your flyer designs. 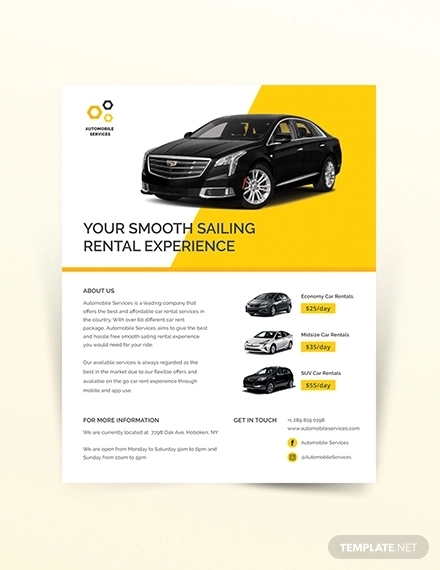 You can grab some ideas from corporate flyers and artistic flyer designs to test your design skills. If you can keep them clean and eye-catching, you’re good to go!